It’s been a while since I’ve read a really great historical fiction novel, and Heather Chisvin’s debut, A Fist Around the Heart, sounded perfect. It ended up being the book that truly got me out of my slump – I flew through this book and loved (almost) every second of it. (From Goodreads) The story of Anna Grieve and her fragile older sister, Esther, begins in Russia in the 1880s. The vicious persecution of Jews has come to such a point that the girls’ mother makes the decision to send her children to Winnipeg with her wealthy employers. Her intention is to join them, but the sisters never see their mother again. Frightened and cut adrift, each girl reacts differently to her new family in North America. Esther’s beauty and glamorous lifestyle hide the fact that she may be losing herself to mental illness. Anna, who is the only one who knows that her sister is suffering, spends her life torn between taking care of her and escaping her. As soon as she can, Anna leaves for New York and makes a new life as a women’s rights activist with an illegal contraceptive business in Manhattan, but her bond with Esther never loses its grip. A Fist Around the Heart is one of those really great character-driven historical fiction novels. It centers around sisters Esther and Anna – primarily Anna – as the adjust to life in North America and their lives take on very different paths. We don’t get to know Esther all that well, and, as a character, she wasn’t dimensional enough to truly catch my attention. Anna, however, is a different story. I loved her. She was flawed and fierce and felt completely real. I particularly enjoyed watching her grow into an independent, feminist woman. Especially since this book takes place in the early 20th century. She’s the kind of character I want to read about, and I’m so glad I got that from this book. The plot was interesting, albeit fairly complicated. The timeline jumps back and forth – usually with warning – and I had to consciously keep track of all the different story lines. There were definitely things I felt could have been left out, but, overall, I do think it was a great story. My one complaint is that the ending felt very anticlimactic. The last third of the book seemed almost rushed, and it was a bit disorienting. It definitely pulled me out of the story a bit, which was a little disappointing. The writing itself was good. Nothing to write home about, but it also wasn’t bad or distracting (just occasionally cheesy), which is really all I want. I don’t think it was particularly obvious this was a debut (often, I can tell from the writing alone), which is always a plus. Chisvin will only get better from here, and I’m excited to see what she does next. 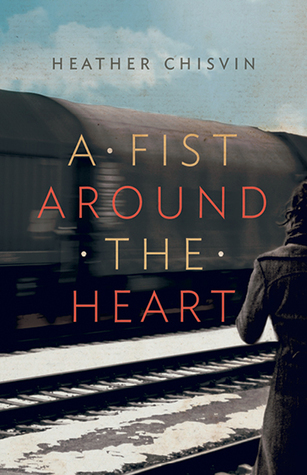 ★★★★☆ – Overall, A Fist Around the Heart was a good historical fiction novel and a solid debut. It deals with some heavy issues – like suicide, mental illness, and birth control – well, and I think a lot of people will really enjoy this. I definitely recommend it if you’re in the market for historical fiction! A Fist Around the Heart will be available in bookstores starting tomorrow, April 10 (you can preorder on Amazon now). Your’re welcome! Hope you enjoy it!